This post contains affiliate links. This is a sponsored post. 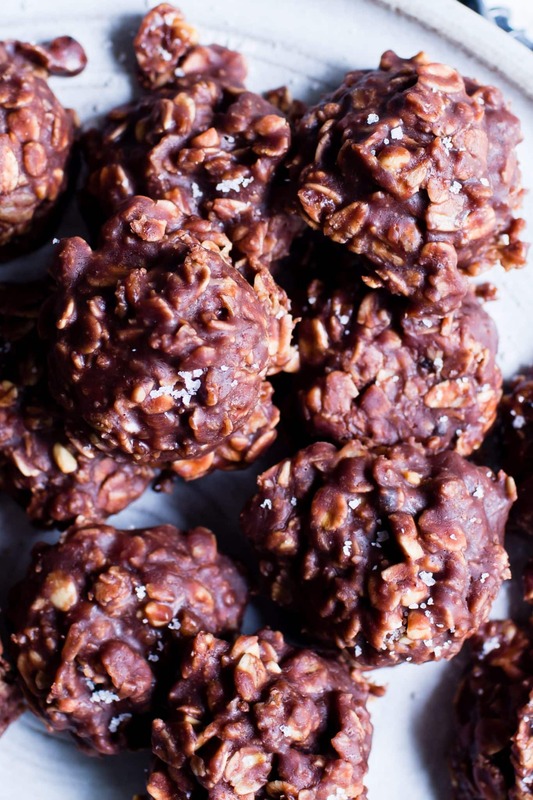 A classic that never goes out of style: Chocolate Peanut Butter No Bake Cookies – gluten free + vegan are super simple to pull together with pantry staples and make fabulous foodie gifts! | Disclosure: This post is sponsored by Rodelle. 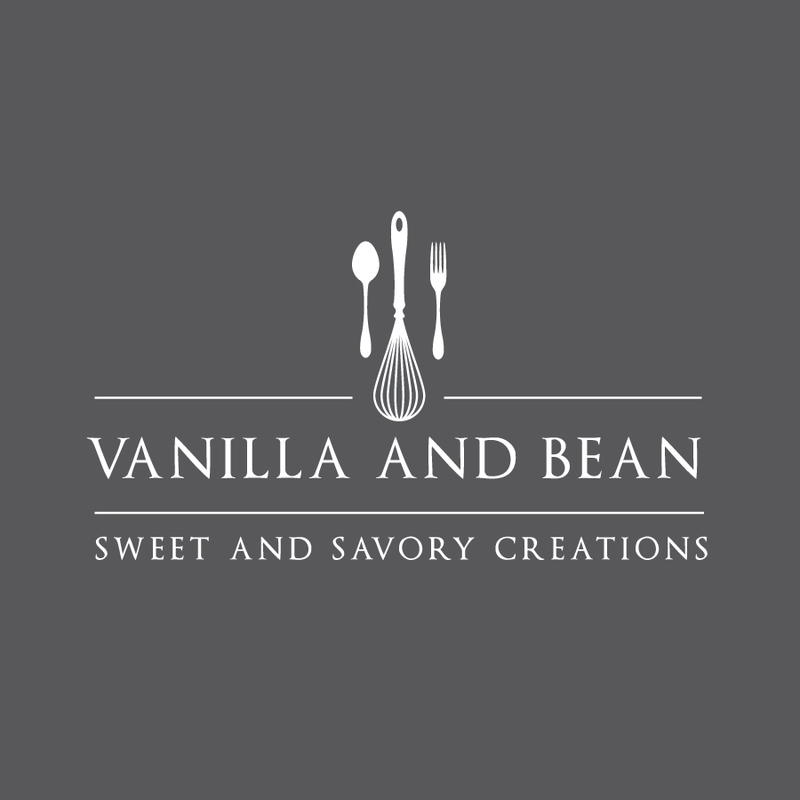 Thank you for supporting brands that keep Vanilla And Bean cookin’! For the love of cookie season and all things cozy, if this isn’t a cookie that doesn’t take me back to when I was a little girl, nothing else will. This recipe comes from my Mom, with just a few tweaks. Chocolate Peanut Butter No Bake Cookies were always a part of our holiday cookie box. From my Ma’s original recipe, I reduced the sugar just a bit and replaced butter with coconut oil (I cannot detect a flavor difference). Also, I finished this no bake cookie recipe with a light sprinkling of Fleur de Sel. Optional, but it takes these little treats to adult status. Making these peanut butter no bake cookies couldn’t be easier and that’s perhaps why they’re such a classic. Oh, and well, there’s the chocolate too! 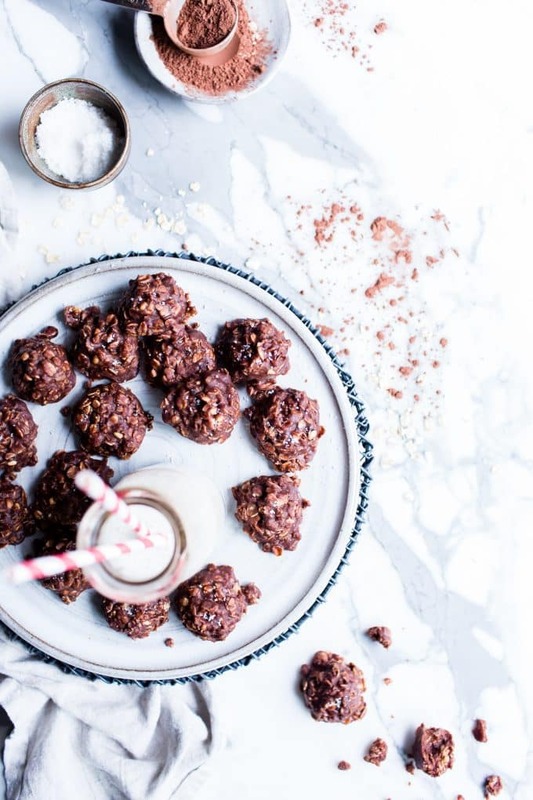 Eight pantry staples is all you need to whip up these easy no bake cookies! 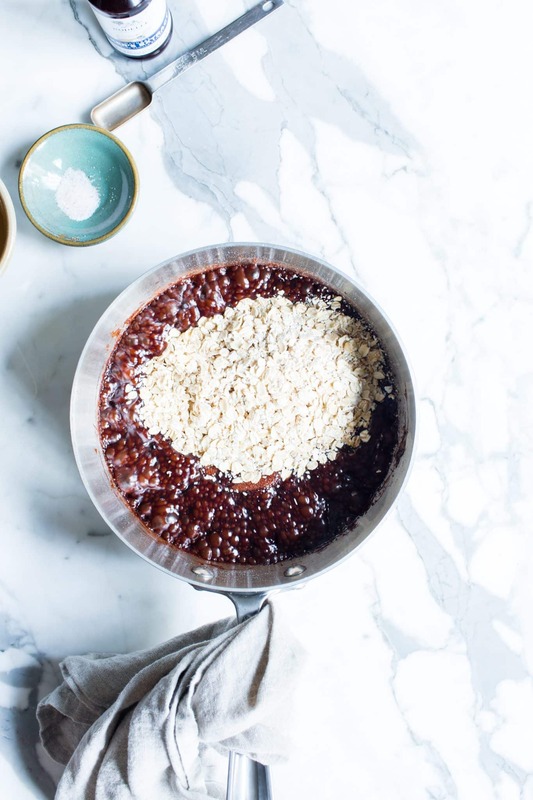 In a medium sauce pot or saucier pan add the unsweetened baking cocoa, sugar, nut milk, and coconut oil. 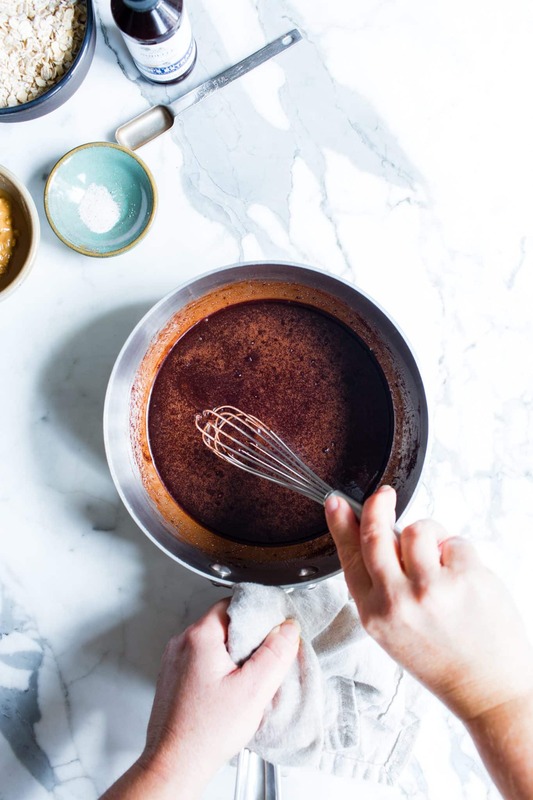 Whisk together until all the ingredients come together. Set on stove to high heat and bring the mixture to a hard rolling boil, without stirring. You’ll know it’s at a hard boil when the bubbles make their way all the way to the center of the mixture. Set a timer for one minute. 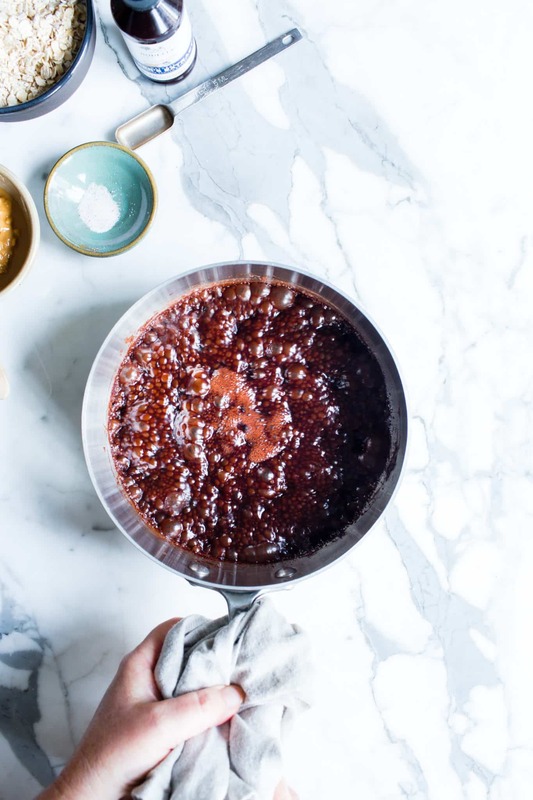 After one minute, remove from heat and stir in the peanut butter, old fashioned oats, vanilla or bakers extract and salt. Working quickly, scoop by overfilled tablespoonfuls onto a parchment lined sheet pan. The cookies will set and be ready to share in about 20-30 minutes. Because this no bake cookie recipe is sturdy and shelf stable at room temperature for about two weeks, they make fabulous homemade gifts! 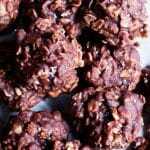 Do Chocolate Peanut Butter No Bake Cookies Need To Be Refrigerated? This easy no bake cookie recipe does not need to be refrigerated. Store them in a lidded container, at room temperature for up to two weeks. Depending on temperature and atmospheric conditions (candy can be finicky) they should go from shiny and soft to a matt and firm finish in about 20-30 minutes. Note that these cookies are considered candy, so making them on a humid day is probably not ideal. If the air is too humid, the cookies may not set properly. They’ll remain shiny and soft. This is also the case if the candy mixture is not brought to a full rolling boil for one minute. Prepare your sheet pans with parchment paper before starting this recipe. Parchment helps the cookies release easily from the pan. Have all your ingredients ready and measured out before turning the stove on. Make sure to allow the mixture to come to a full rolling boil, otherwise the cookies won’t set. This means that the entire mixture is boiling, not just around the edges. After the mixture has bubbles (or is boiling) all the way to the center, then set the timer for one minute. Do not stir, and boil for one minute. Work quickly after mixing all the ingredients together. You’ll notice the mixture starts to get firm as it cools. So getting them scooped and on to the pans quickly makes for easy scooping. I’ve included a single and double batch in the recipe for your baking fun! 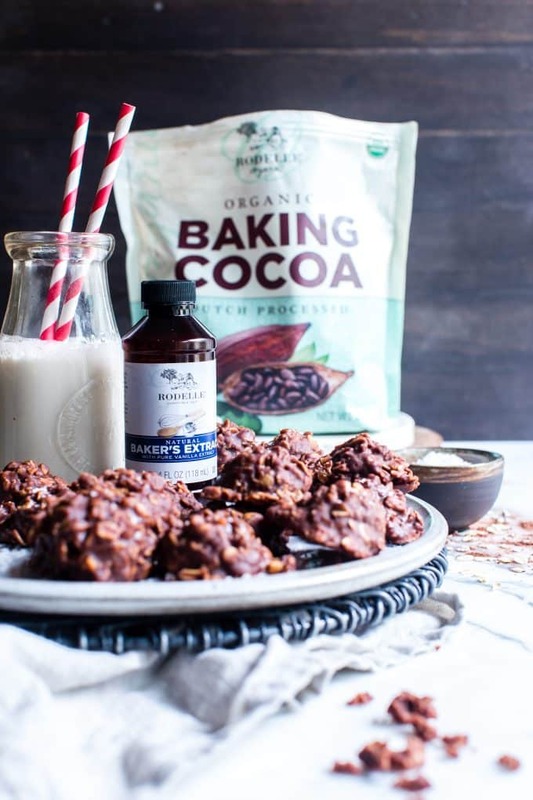 Rodelle’s Organic Baking Cocoa is a fabulous choice for this Chocolate Peanut Butter No Bake Cookie Recipe. It’s ultra rich, smooth and dark and produces consistent results every time. 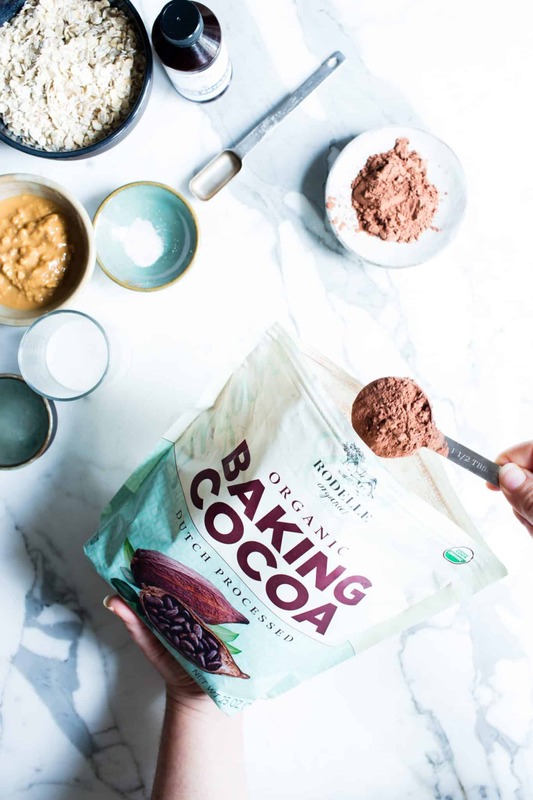 Their Baker’s Extract is a blend of vanilla and chocolate extracts balanced and lovely in any baked recipe. Find Rodelle on their web site, Facebook, Pinterest and Instagram. 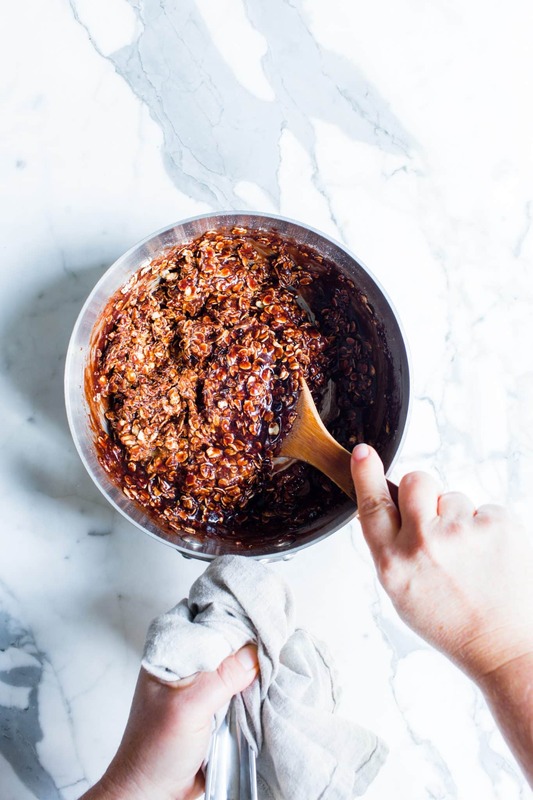 Be sure to check out Rodelle for more cookie recipe inspiration, where they’re hosting their annual 2018 Cookies by the Dozen, rounding up cookie recipes from all their brand ambassadors! A classic that never goes out of style: Chocolate Peanut Butter No Bake Cookies - gluten free + vegan are super simple to pull together and make fabulous foodie gifts! *Find more tips in the blog post above. Single and double batch recipe included below. Use a #50 cookie scoop to make portioning a snap! Line a sheet pan with parchment paper. One for one batch, two for a double. Set aside. In a medium sauce pot or saucier pan add the cocoa, sugar, milk, and coconut oil. 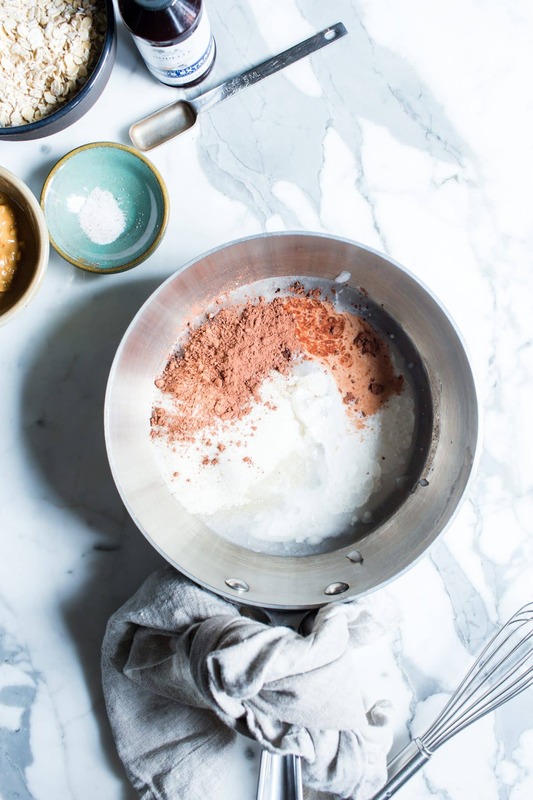 Whisk together until all the ingredients come together. Set on stove to high heat and bring the mixture to a hard rolling boil, without stirring. You'll know it's at a hard boil when the bubbles make their way all the way to the center of the mixture. Set a timer for one minute. After one minute, remove from heat and stir in the peanut butter, mashing if needed, until incorporated. Immediately add the oats, vanilla extract and salt. Stir. The mixture will begin to set up, so working quickly, scoop the cookies by tablespoon fulls or with a #50 (about 1 1/2 Tbs) cookie scoop onto the prepared sheet pans. Allow the cookies to set at room temperature, uncovered for about 20-30 minutes. They'll go from shiny soft set to a firm dark brown matt finish. They're now ready to eat. Store at room temperature in a lidded container for up to two weeks. Note that these cookies are considered candy, so making them on a humid day is probably not ideal. If the air is too humid (what that threshold is, I'm not sure), the cookies may not set properly. They'll remain shiny and soft. This is also the case if the candy mixture is not brought to a full rolling boil for one minute. If this occurs, you can set the cookies in the refrigerator to firm further (and they'll taste fabulous! ), but they'll still be soft at room temperature. Do you know what temperature the chocolate mixture should reach? I made these twice this week and could not get them to firm up (although the second batch was better than the first, I’m not sure why). I do have an induction stove, so things boil faster, and from the middle of the pan rather than the edges, so I don’t know if that affected anything. But I brought them to a full boil, bubbles all the way to the sides of the pot, and timed the first batch for 1 minute and the second for about 80 seconds, but still no go. Thanks! Hi Donna! I’m sorry to hear these didn’t set for you. Because I’ve always made these using the method as stated, I’ve not temped the boiling mixture. I have made these before on a humid day and they didn’t set, so I popped them in the freezer for about 15 minutes. They were still shiny but tasted soooo good! Oooo, Love these! I decided to make them as a treat for myself since I’m having to strictly adhere to a dairy and GF food plan. Not having classic Christmas cookies (which the kids and I made last night) felt like a hardship so I just now whipped these together. Hardship over!!! If my kids make it onto the nice list I’ll share ;-) Thank you! Oh my! Thank you for coming back and leaving a note, Tonya. SO happy to hear you treated yourself – way to goooooo! I LOL about the nice list! These just make me happy! Anything ‘Mom made’ is always the first to get made, and the first to go! ;) I love these, Traci!! These were so good! My son & I made these cookies together- it’s a perfect recipe to include the kids in. I think the key thing to remember is boil for a full minute so they set. My son was antsy to eat them, so we stuck them in the freezer for the set time 🤗. Excellent recipe! Hi Autumn! So happy to receive your note and hear that you and your son made these together! What a treat. Thank you for coming back and leaving a note! Yum, these look delicious! Love that they are no bake and how fast and easy they are to make. 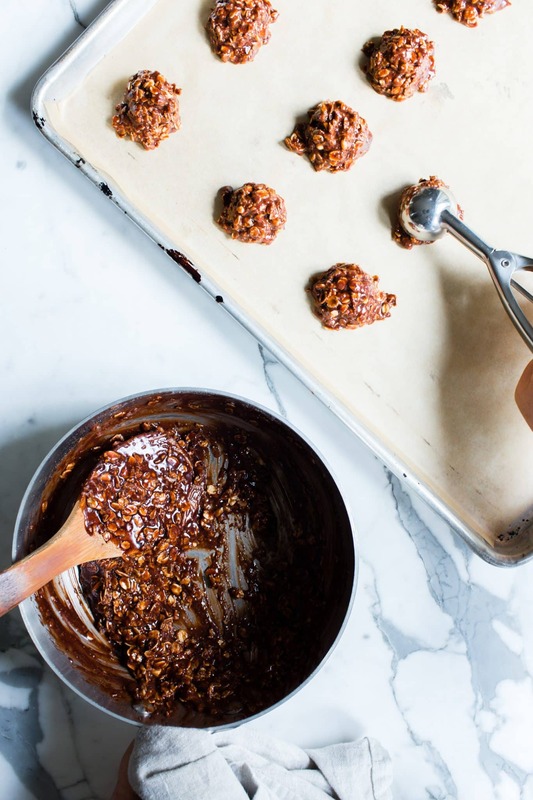 I’ve never tried no bake cookies before – so I think I need to start with these to share with my office pals! Love that you are sharing two batch sizes – that’s so helpful – I need to make the larger one. Thanks, Traci! I love how you treat your office co-workers with homemade gifts… that is such a sweet gift, Geraldine. I hope you enjoy the recipe! 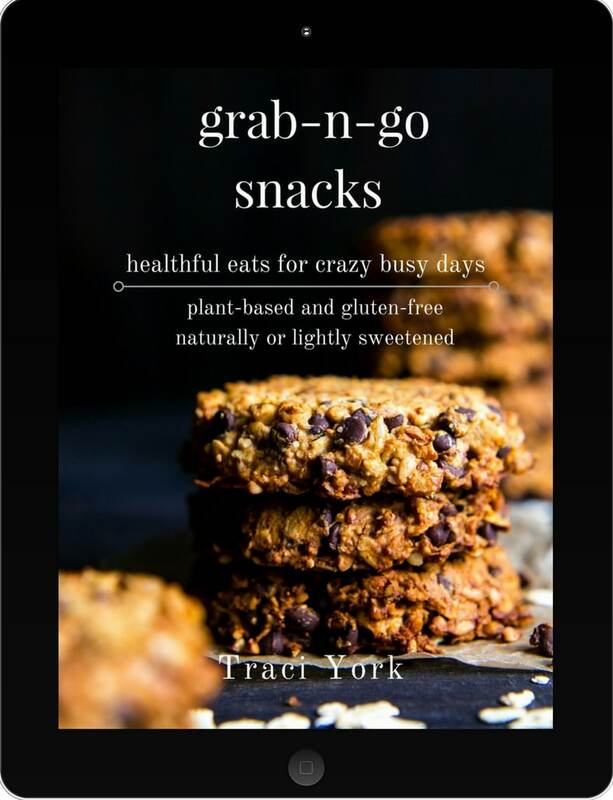 I love easy treats like this for the holidays Traci! I always include a no bake treat in my holiday cookie boxes! I’ve got to try to get my hands on that Bakere’s Extract. Love the combo of vanilla and chocolate! Aren’t they so fun? And so well loved too! I think you’ll really enjoy that baker’s extract! Haha! Mine too, Liz! But the ease of these cookies can’t be beat… and the salt adds a nice zip! Such a perfect holiday treat! I love anything with chocolate and peanut butter, and I love how quickly these come together during the busy baking season! Such a classic combination! Love it too, Laura!